Feelings. Such strange diversions. You have a plan, you work with a pinpoint mindset, and then suddenly everything seems to change. Goodbye mindset, goodbye plans, and hello diversion. How can things change so abruptly leaving me totally unhinged? How can I have a plan in mind and not execute it till the very end? Why are feelings such a liability? Why does a person have to be emotionally mute to sustain and persevere? Why can&apos;t "feelings" and "consistency" be on the same level? I admit. I have become slightly diverted. Okay, adequately diverted from our true plan. I realized that I had some sort of...affections towards Kalon. Big time. I started second guessing my options, even though Cecilia and I agreed that three months were to be spent in Greece. Yet, Cecilia couldn&apos;t stick to the agreed upon schedule. Why you may ask? Well I asked and she told me that Greece offered nothing but misery. Yet, I couldn&apos;t help but think about what Cecilia said before she was on her way to France. That night Kalon and I went to a wedding. A village girl his parents knew. I kept looking at him, how he greeted his relatives, helped with glassware and chairs, danced with his young cousins. Could this person possibly inflict harm? Hurt a person beyond the sense of hatred? Was Cecilia exaggerating? As I was perplexed in my series of questions about this anomaly called Kalon, he pulled a chair ceremoniously and seated himself next to me. "You should do it." he said out of the blue. I looked at him questioningly, "do what Kalon?" "That thing on your list." "It&apos;s not on the concise list Kalon, it has no priority" I said matter-of-factly. I knew which one he meant. He has teased me continuously about it, that it had its own kind of required bravery. "Go ahead Jilly, it would be quite entertaining" and there&apos;s the smirk again. Staring right into his eyes, I rose from by seat tapping the glass with a fork announcing my intention to toast. Toast at a strangers wedding. Weird, unorthodox, and meaningless. Never knew why I thought of it and put it on the list, but at that time I did. Never added it to the concise list because I didn&apos;t consider a priority then. Kalon says the smallest things (gestures, places, deeds...) can accumulate to make a big difference in our lives. He quotes the phrase from his favorite movie: "and what is a sea but a multitude of drops". Forever an optimist. He kept prodding, urging me to continue. The whole place was staring at me, anticipating what I was going to do next. I didn&apos;t speak Greek. Nearly two months and not a word. Julia Roberts learned Italian in three months, I guess my absorption for information is off. I opened my mouth, but apparently I had suddenly become mute. No words escaped my mouth. The confident bravado I was trying to display completely vanished. I had this unnerving feeling to throw up, or hide in a corner and throw up. Then I felt slight pressure on my hand, a large entity enveloping my tiny hand, a warmth of some sort. I looked to its source and found solace. I held my stance and depended on my translator. "Love...the word...the concept. 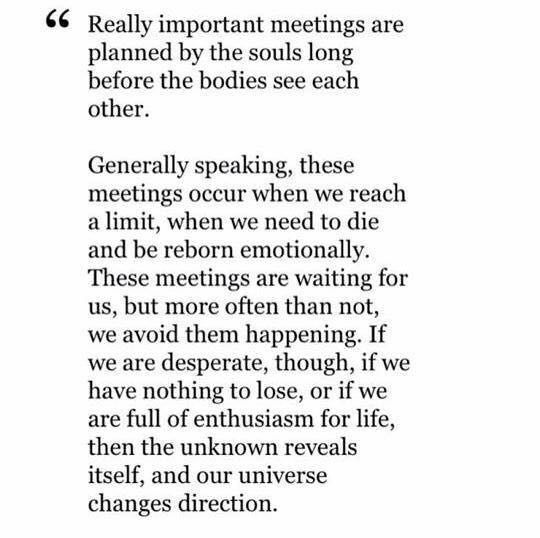 Soulmates, the happily ever after that we aspire to. We always have this personal checklist when we meet someone new: do they have a sense of humor, do they dress appropriately, what they do for a living, and even the simplest things like do they make noises when they eat. I had one. And I bet every single one here has one too." I stared at Kalon who was translating the whole speech, "but that&apos;s the thing about life, it never seems to go as planned. And that&apos;s the thing about serendipitous encounters, it isn&apos;t your mind that analyzes the person. I have learned it is our very soul. Our true compass leading us to our true north. The person might be flawed, broken, totally intolerable, and yet you find comfort and love in this person. You find home. I am a nomad, unaware where my true north is, I never will probably", I said vaguely as I stared at my wine glass," I am just so glad these two today found home in one another. To true north." I raised my glass as every other person in the room said the cheers-equivalent in Greek. The guests applauded, and I resumed my seat. "You are such a jerk, I should never have done that." I assumed the fetus-position. "You were quite eloquent darling, extremely nice words. I hope most of it is true though..."
"Well a little white lie never really hurt anyone..."
"You don&apos;t believe in your own words dear?" "My alliance with optimism and love was severed the minute I left a four year relationship. Love is as obscure and minacious as always." "You cannot possibly believe that Jilly. The whole thing is wonderful. Mysterious, enchanting, this process that throws you to the unknown that is another&apos;s mind. How could that be minacious?" "Exactly Kalon. The unknown. Whether you might stay together or leave each other the next hour, or you are determined to spend the rest of your life with this person and that person suddenly realizes he/she doesn&apos;t love you the same as before. How could that NOT be a horrific process? A crippling risk?" "Well you will never know unless you try. Yes your heart gets beaten and broken in the process, but life offers second chances, and everything and everyone deserves a second chance." He paused. "Would you like to dance Jilly?" giving me an uncertain smile. Dazzling. Hope. That silver lining that people cling to. I never expected this. Nor did I plan it. I only wanted to travel and meet people. I wanted to fix myself. Do the things I wanted to do. How could this be? Why did I have the sudden need to stay? For the rest of the night I forgot to talk to Kalon about Cecilia. "Would you like the window seat ma&apos;am?" the woman booking my ticket asked. "Whatever will do, just please hurry up." The faster I leave the better. I didn&apos;t want to stay one goddamn second on this forsaken island. Cursed. I knew it. The fates conspired and plotted against me, that&apos;s the only explanation for this unwanted turn of events. She liked him, really liked him. I could see it in her eyes; that glimmer. This menacing glimmer of infatuation. I warned her, I really did. She didn&apos;t heed my warning. Not the slightest. He will break her already damaged spirit, which I was also certain of. He is a selfish demon, preying on the hearts of damsels. Not damsels, but women so resilient he wanted to prove anything can be broken. It was only a matter of time. Then we have to restart the process. At least Zen never broke her heart, although she shattered his. She deserved Karma&apos;s intervention. That poor guy. Once he called practically begging for any sort of news about Jillian. I offered the information he needed, except the information involving that swine of a human being. He didn&apos;t need that. He never got his closure. I was not going to rub alcohol on the wound. France. My ultimate destination. I shortened my duration in Greece and booked my flight to France. All I could really think about was that lavender field. The old couple, that wise old lady. Oh how I needed her right now. I was encouraged, this silver lining I wanted so much to twirl around my fingers. This comfort knowing I was where I am meant to be. South of France. I boarded the plan with Edith Piaf&apos;s voice in my head. France puts you in the mood remotely. Then I was dragged by the heart down memory lane. I remembered the last time I went to France. I remembered the caviar, the wine, the rural delights, and my companion. I felt this tug on my heart. This clutch possessing the whole organ refusing release. It hurt knowing he is not here with me. It hurt knowing I will never be like the old couple I wanted oh so much to be like. The possibility of a dream coming true delights a person, the probability of it never coming true extremely discourages a person completely. I was putting all my hopes and the remainder of my sanity on this. I needed the field and the wisdom of the old lady who owns it.